A Video Photo Montage is a perfect way to celebrate a special day or event. C2 It Multimedia takes a very unique approach to the production of our photo montages. We work closely with the client to insure that their vision is translated into a truly treasured memento. 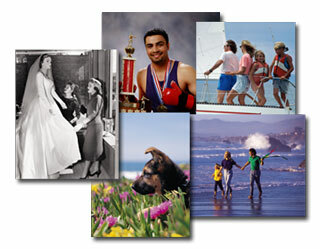 We use a high-resolution transfer process to ensure that every detail of your original image is faithfully reproduced. Each slide/photo is hand cropped and scaled as needed. We use professional color correction tools to insure the best image possible. From there our team blends your photos into a seamless video incorporating Hollywood quality transitions and effects. We work with the client to determine the optimal timing for your montage. This is a critical step as you want to your intended audience to maintain their focus. Our team then creates truly stunning animations and 3D effects that add just the right amount of character to your montage without distracting the viewer's attention from the subject of the video. Of course a hugely important part of any photo montage is the soundtrack. Our approach is to make sure that the music supports the imagery. Our editors are experts at audio production so the soundtrack for your montage will sound like an integral part of the production, not just an afterthought. Our photo montage videos can also incorporate film/video clips from your collection, and we can even add a custom voiceover done by yourself or one of our voice actors. One other benefit of having C2 It Multimedia create your photo montage video is that your finished DVD will include the edited versions of all of your photos. This will allow you to make prints, email them to friends and family, etc. Our basic photo montage package starts at $75 for 50 pictures. Of course there are numerous options and additions that can be added to truly customize your montage. To help you begin your project we have made available a Photo Montage Guideline/Order form . This will walk you through the entire process and outline the available options that can be included. We're pleased to provide our potential clients with the opportunity to review some of our past work. Please navigate to our Photo Montage Examples page to take a peek.